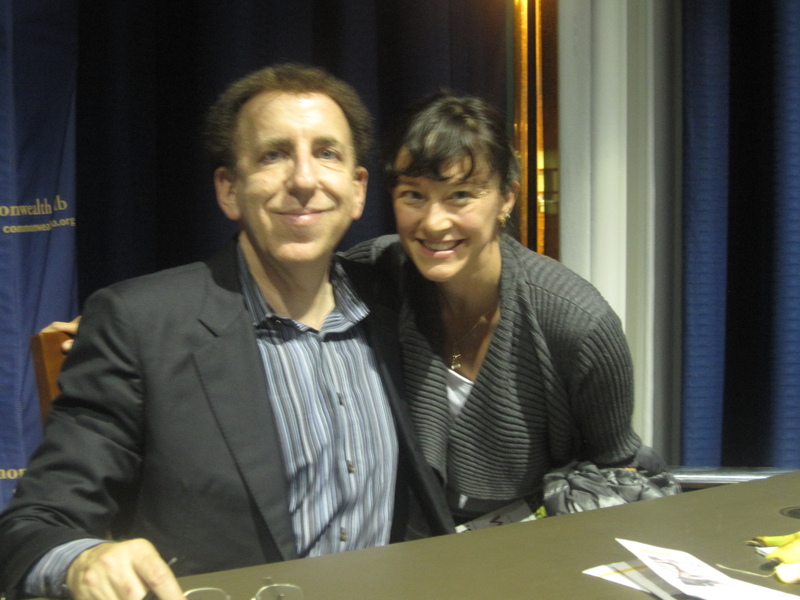 Last week I had the opportunity to hear Dr.Dean Ornish speak at the Commonwealth Club. This was my first time seeing Dr. Ornish speak and I was immediately impressed with his ease of public speaking; his warmth, sense of humor and a palpable sense of passion for optimal health for all people. Dr. Ornish has been publishing clinical research and promoting lifestyle change for over 30 years, and one of my favorite quotes of his from the talk was “why is eating vegetables, walking and meditation ‘radical’ but surgery like angioplasty is not”. His ground-breaking research has show that holistic lifestyle changes alone can reverse heart disease and may stop or reverse early stage prostate cancer. The title of this talk was “Change Your Lifestyle, Change Your Genes!” since recently he has been working on how these same lifestyle changes can affect gene expression. His research showed that these healthy choices can “turn on” disease-preventing genes and “turn off” genes that promote cancer and heart disease. Remember that you genes are being passed down to your progeny so by positively manipulating your genes to stay healthy you are protecting future generations as well (another reason for those self-less folks out there). Additionally his research (done in collaboration with Nobel laureate Elizabeth Blackburn, PhD) has also showed that these lifestyle changes can lengthen telomeres, the ends of chromosomes that control how long we live…..
Quite compelling reasons to sign on to his “program”, right? You must be wondering what it is….well his first books (most famous is“Eat More, Weight Less”) talked about the lifestyle changes that he used in his research. This was/is a very low fat mostly vegan diet (<10% of your total daily calories coming from fat ), at least 30 minutes of moderate exercise every day, stress management (via meditation, breathing techniques, yoga, etc) and psychosocial support (feeling of love and intimacy). 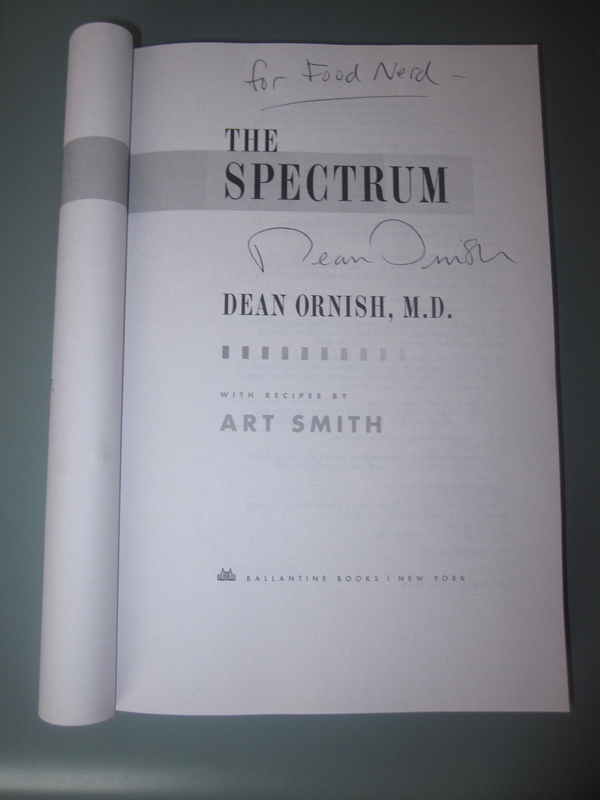 Well it turns out some of his critic’s say his diet is too hard to follow (although study participants were able to continue for at least 5 years according to the study I linked to below) so in response Dr. Ornish has come out with the Spectrum, which is exactly that. He promotes a spectrum of choices and encourages people not too think in black and white/ all-or-nothing perspectives but rather head towards healthy, sustainable lifestyle change. If you don’t need to reverse heart disease, then you don’t need to go on the extreme program, just start adding healthier choice and take a compassionate approach to lifestyle change. That’s what I am talking about! I appreciate the Spectrum concept because it matches my own philosophy that you to make change you have to do it gradually and it has to come from you and from curiosity and love of health not fear and restriction. To make changes to feel better and feel the joy of being alive in our amazing mind-body-heart system. The Spectrum book has two parts, with part 1 covering the “Nutrition Spectrum”, “Stress-Management Spectrum”, and “the Exercise Spectrum” with some tools (guided meditation etc). The book then discusses how to use these tools to lower your cholesterol and blood pressure, loose weight, prevent/reverse Type 2 Diabetes, Cardiovascular Disease and Prostate/Breast Cancer. 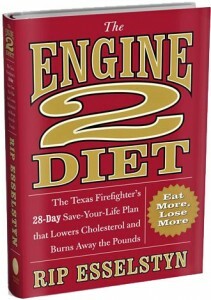 Part two is written by Art Smith and included the recipes and kitchen tips and tools to cook your way to this new health spectrum. The book also included as DVD to help you with meditation and mindful eating -for more on mindful eating see my previous post. Love that he included a DVD to get you started on what can be a scary prospect (you mean…I just sit there…) and his lovely wife contributed to the DVD as well. For me this book has a lot of information I know already but I am still enjoying the recipes (will post one later in the week) and hearing/reading his holistic perspective inspires me to keep walking this path for my own practice. I give it a like button thumbs up! Click here to download a PDF of Dr.Ornish’s 2005 clinical trial to prevent prostrate cancer with his lifestyle changes. Very science-y but I love this kind of stuff and thought you might too.